Finally, Google's latest camera phone is official - and it brought out Annie Leibovitz to prove it. The Google Pixel 3 and Google Pixel 3 have been unveiled at an even in New York and it's clear from the off that these are not phones with cameras, but camera phones. Google, as we have seen from the many Google Pixel 3 leaks, has put a massive amount of effort in making sure that its latest handsets have camera capabilities that match or trump the best camera phone around at the moment. The world's best camera, eh? Well, we will be the judge of that. But what you get for that statement is a single rear camera on both phones - yep, that's right it is not going after the dual-lens or triple-lens phone market just yet, reckoning just one lens will do fine. 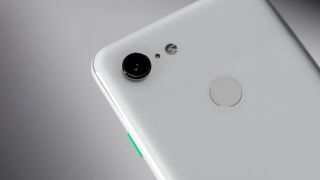 The Google Pixel 3 and Google Pixel 3 XL, however, do have two front-facing cameras. The reason for this is that one of them simply offers a wider field of view so you can pretty much get more people into your picture. Given the Google Pixel 2 had one of the best cameras (on a phone) around, we can understand why Google is making some big calls about its camera technology. On stage it even brought out Annie Leibovitz to take some pictures with the camera to show how good it is. The camera specs are as follows: a 12.2MP rear camera with f/1.8, 8MP dual front cameras and these are backed by the power of a Qualcomm Snapdragon 845 chip. Size wise, the Google Pixel 3 has a 5.5inch FHD+ OLED, while it has opted for a 6.3inch QHD+ OLED on the Google Pixel 3 XL. The biggest camera bits, though, are its AI capabilities. Its got Google Lens built in so you can point the camera at an object in real life and buy a version of that object through the phone. As per the leak, there is also two AI modes to help better select the decent pictures you take from the crap one. Top Shot sees the camera taking a selection of images before and after you press the shutter - it will select the best ones for you. Photobooth gets rid of any photos that aren't photogenic and leaves you only with the decent ones. The Pixel 3 and Pixel 3 XL also have their very own custom-designed imaging chip that is designed purely to improve the image quality of your shots. The cameras use HDR+, so those shadows in your images will be equipped with much more detail. The rumor about Super Res Zoom is also real. This allows you to take a zoom shot without actually using the telephoto telephoto lens. The zooming is purely done in the software of the device, which might send shivers down some photographers' spines. Another new feature is something called Night Sight, which will be coming a bit later to the phone. Use this and you won't have to turn on your flash when taking nighttime shots, apparently. To show off the feature, Google showed its (admittedly better images) next to ones shot on the iPhone XS. The Pixel 3 images were bright, while the iPhone's were a lot darker. Both Pixels come with free unlimited Google storage the cameras has other features, including improved bokeh and better scene detection. It's actually pretty impressive that Google is doing all of this with just one lens - there is definitely a big onus on the software it is using for its AI smarts - it's even taking on Apple with the ability to adjust portrait mode blur in camera. The Google Pixel 3 release date is 1 November. It was revealed at Google's big 9 October event, along with a slew of other devices, and pre-orders are set to roll out from 10 October.